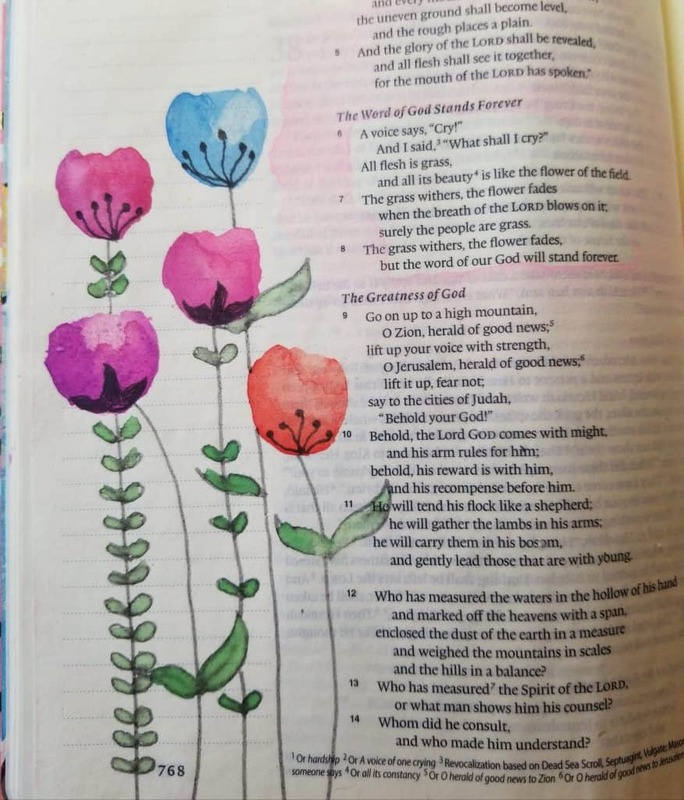 Whether you are an ol’ pro at Bible Journaling or brand new to the practice, learning how to draw flowers for Bible journaling is a great way to add simple beauty to your pages. Once you master them, you can use them on cards, personalized notepaper, pages in your War Binder or anywhere! 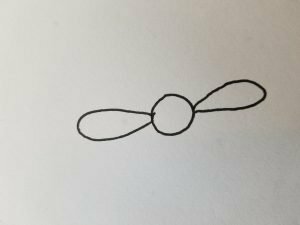 In this post, I’ll share how to draw six easy (and so pretty!) 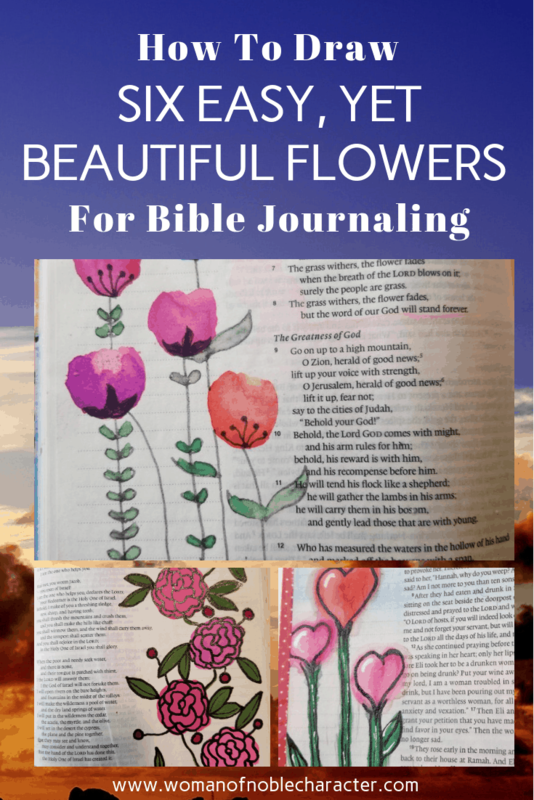 flowers for Bible journaling. All you need is a pencil with an eraser and something to color the flowers with. For this post, I used a mechanical pencil, Fude Ball Pen and Stampin’ Blends. 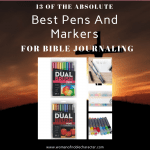 (Check out this post on the best pens and markers for Bible Journaling). 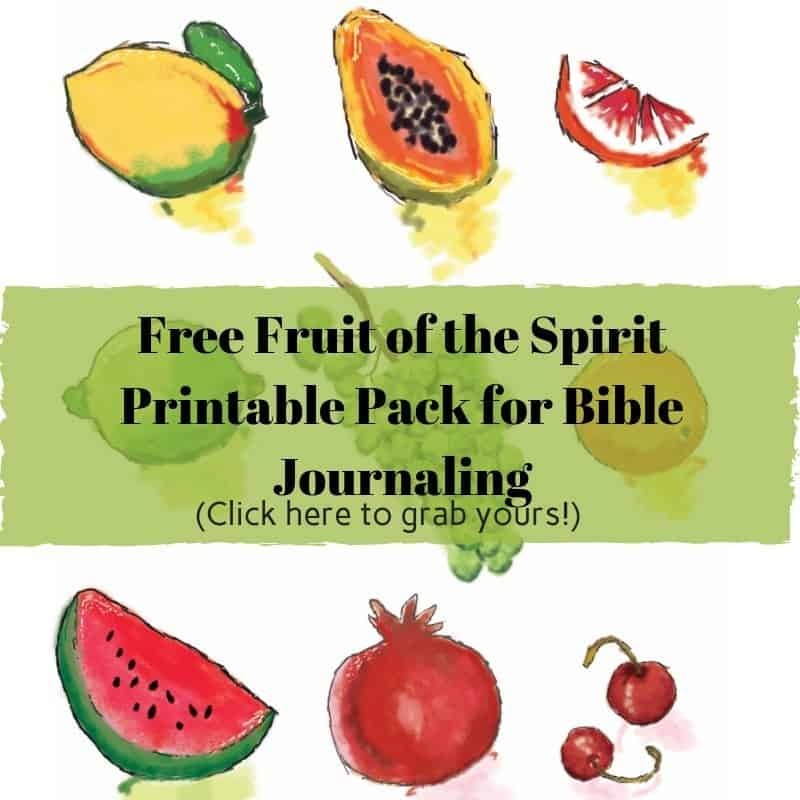 Ready to learn how to draw flowers for Bible Journaling? Let’s go! 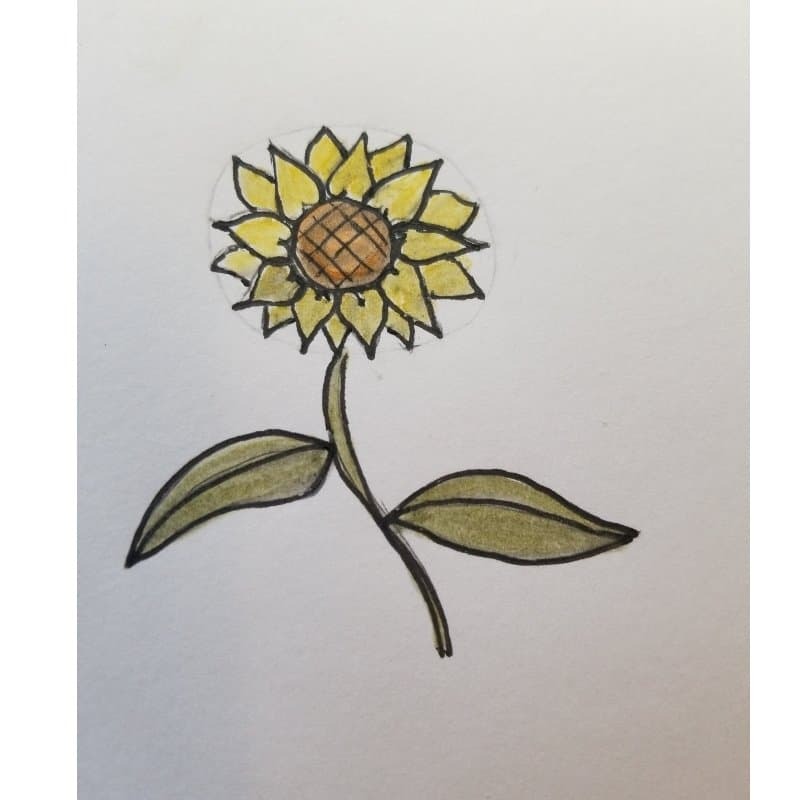 Sunflowers are such cheery and popular flowers and are great flowers for Bible journaling as they are so easy to draw. 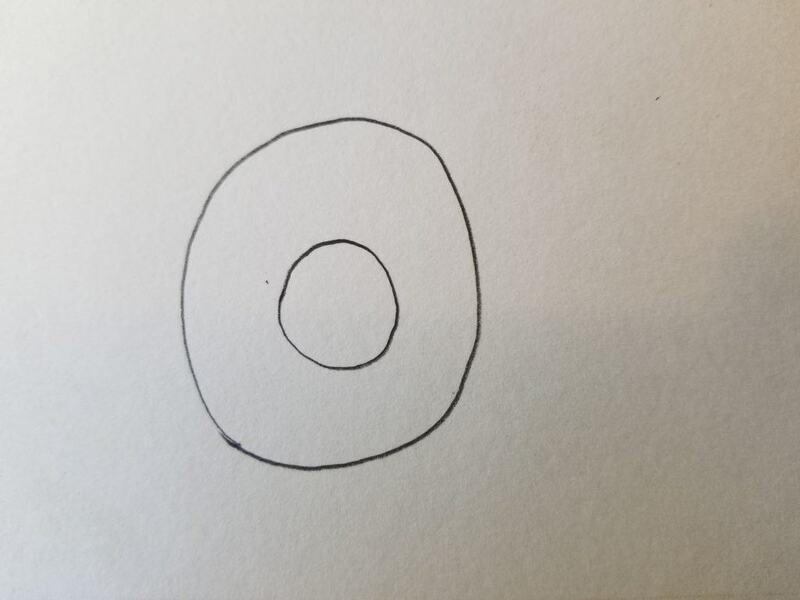 Start by drawing one small circle and then a larger circle around it (it’s best to draw lightly as the outer line will be erased later. I drew them darker so they were easier to see in the photos). Add a line for a stem and leaves. Go around the circle and draw thin hearts completely around it. 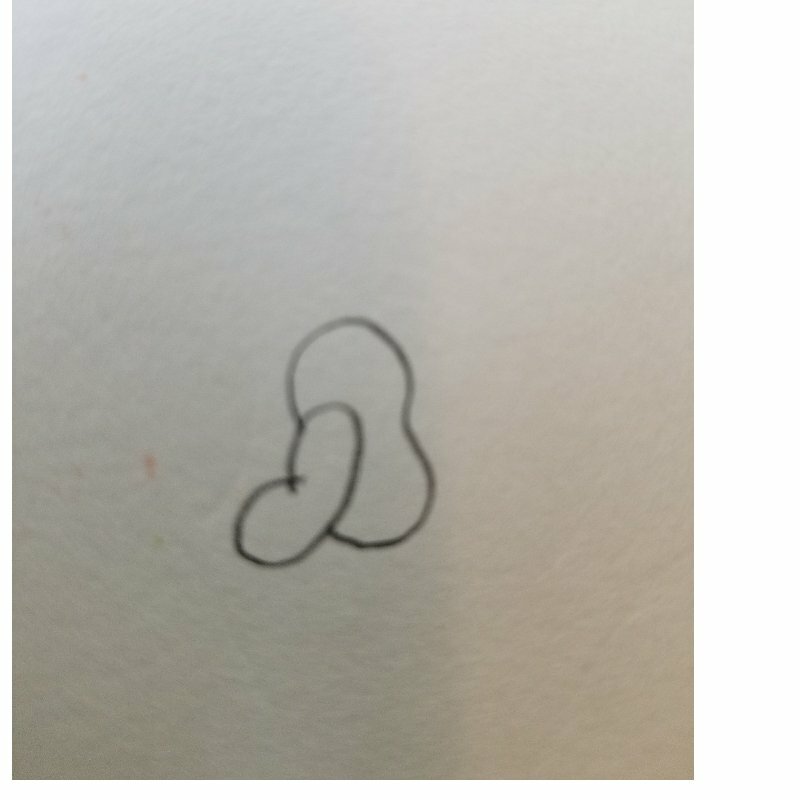 (the “point” or bottom of the heart should touch the outside circle). Fill in the spaces between the hearts with “Vs”. Add lines across the center circle, turn page and add lines the other direction, making a hatch mark pattern. Then add lines for detail to the leaves. 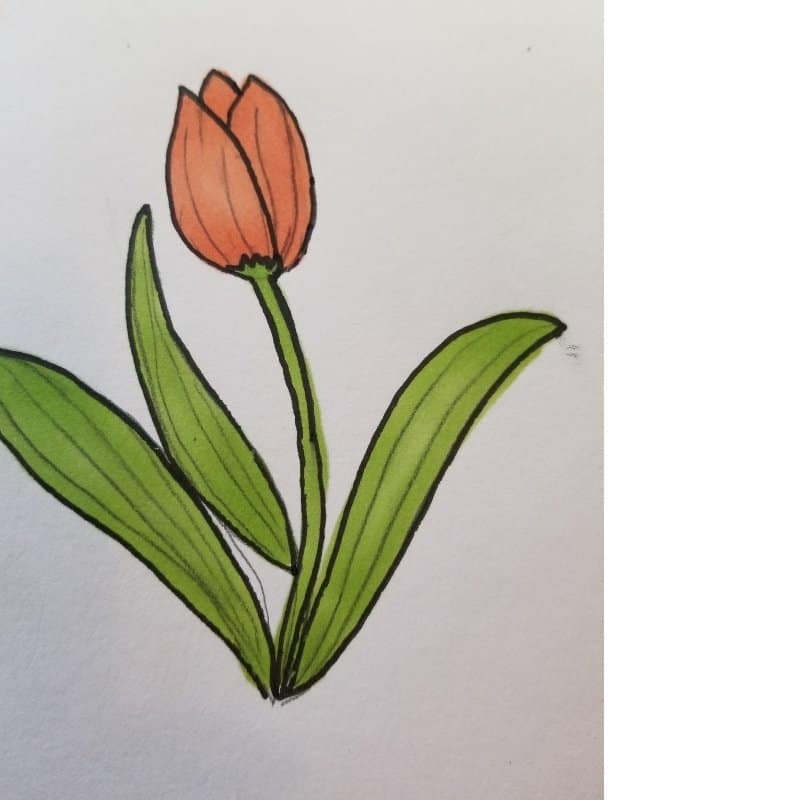 Color the flower and add details with pen. A beautiful sunflower! 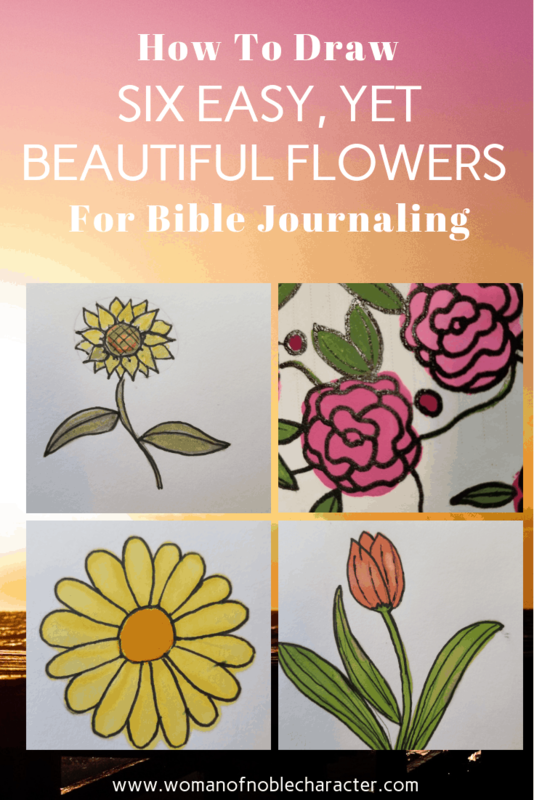 Aren’t these great flowers for Bible journaling? 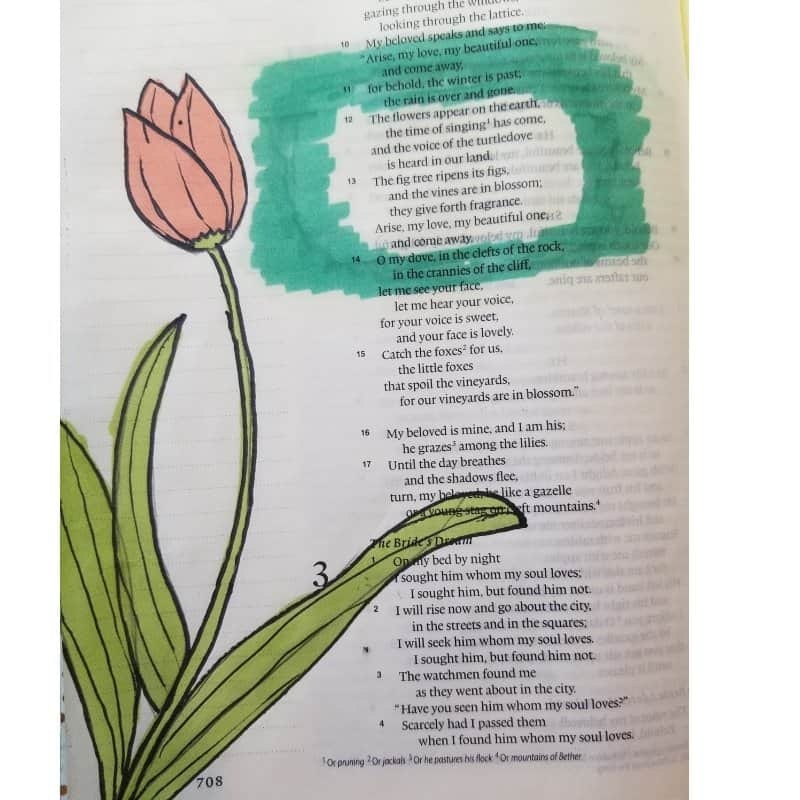 Tulips are one of my favorite flowers for Bible journaling and to receive! They are super simple to draw. 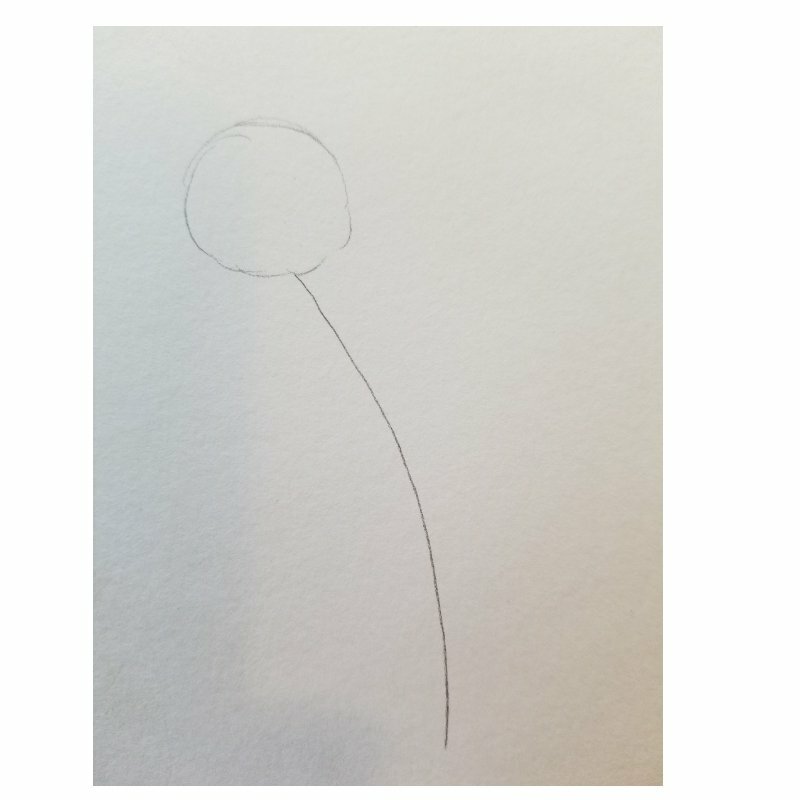 Start by drawing a circle and a curved line for a stem. 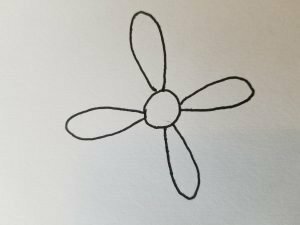 Using the circle as a guide, draw two overlapping petals then one V shaped petal in between. 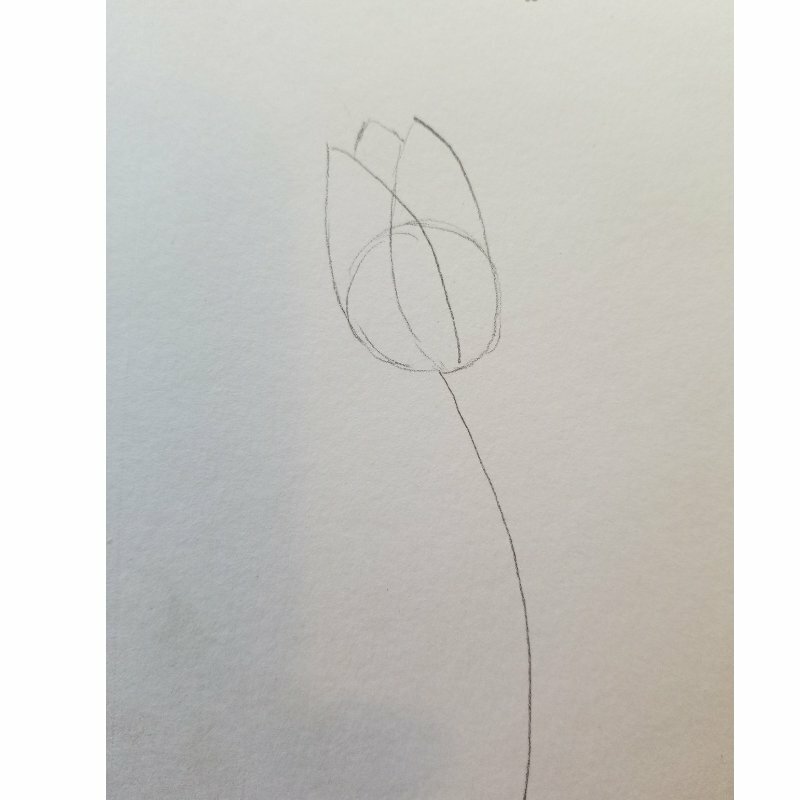 Add the base of the flower under the bulb, flesh out the stem and add leaves. Add details. 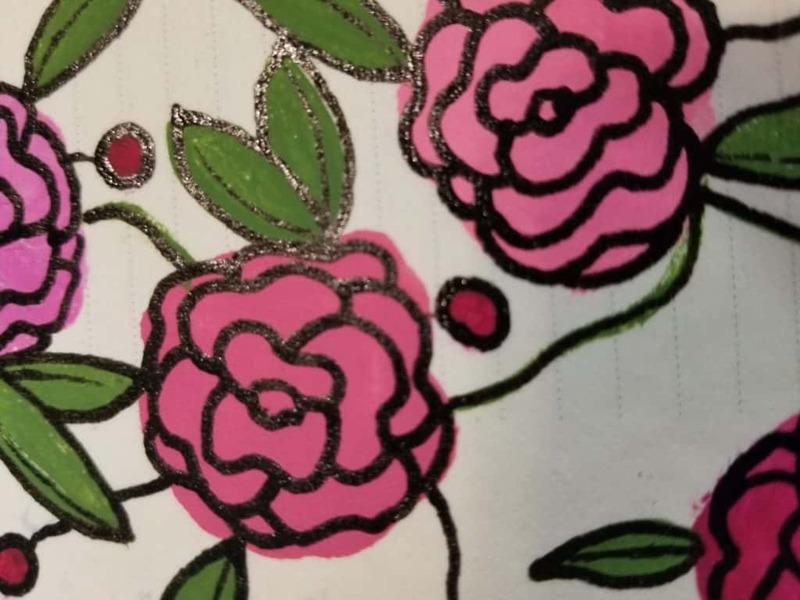 Since I was coloring with Stampin’ Blends, an alcohol based marker, I used a color lifter to remove some color where I wanted to show light or highlights. 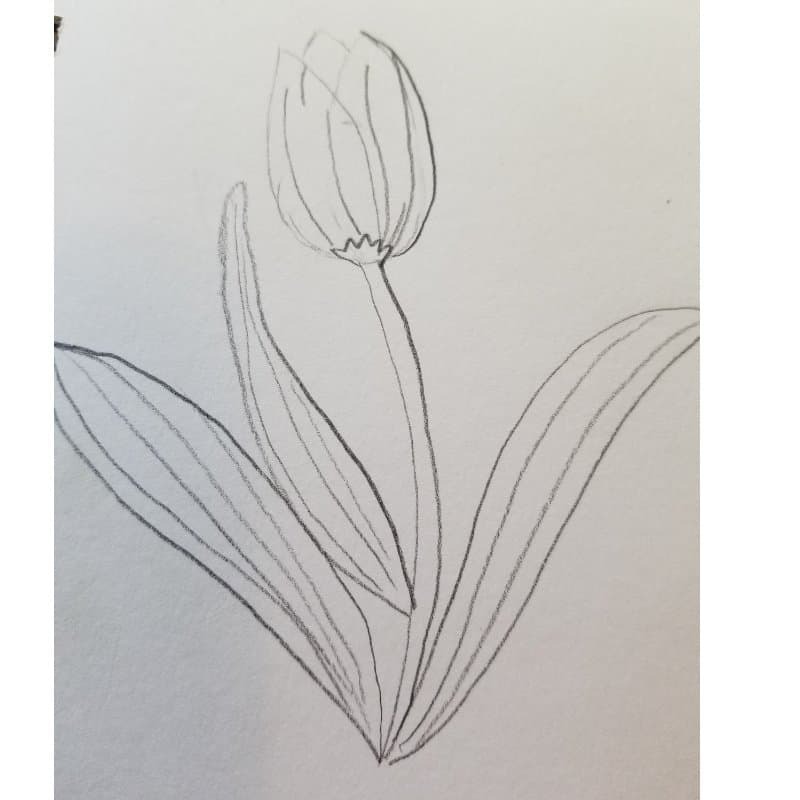 Here is a tulip on a Bible page that I’ve started. 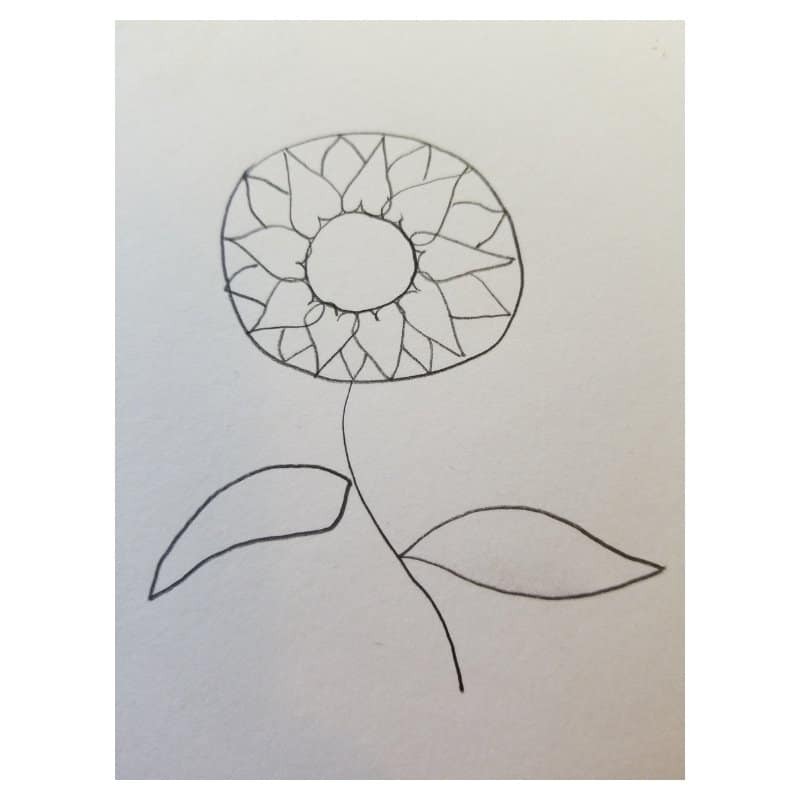 Start by drawing two circle as you did when drawing the sunflower. 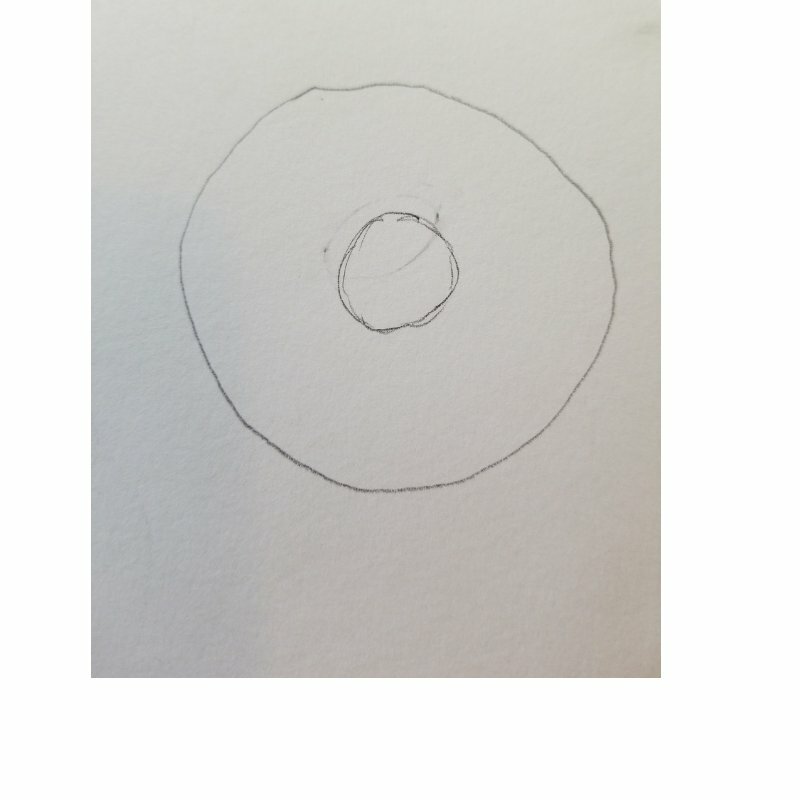 One small circle and one larger circle around it (it should look like a CD). 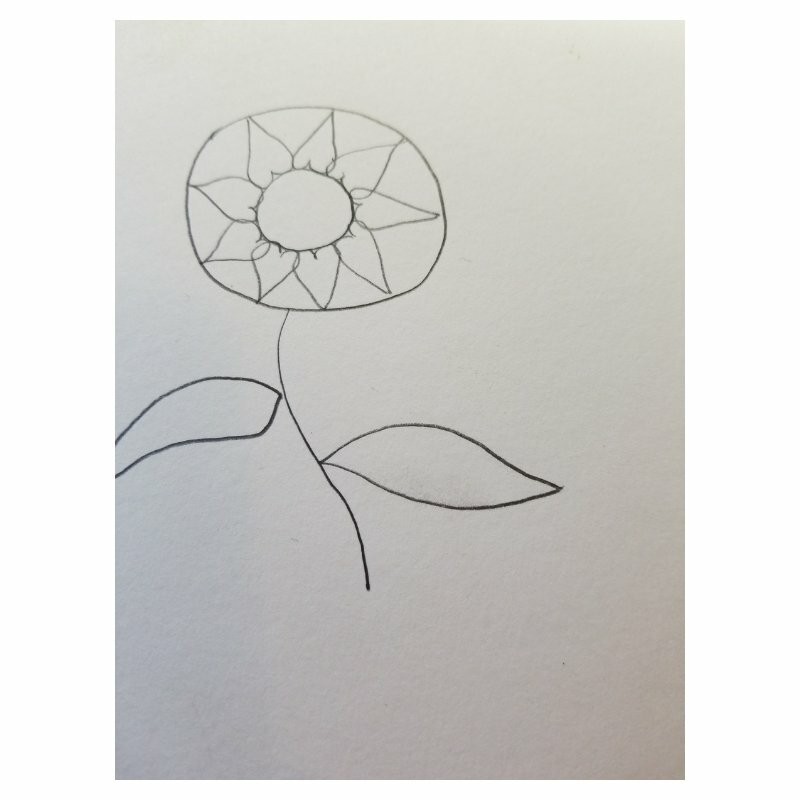 Add petals by drawing one petal then drawing another one directly opposite from it. Continue adding pairs of petals around the circles. Fill in the blank spaces with petals. 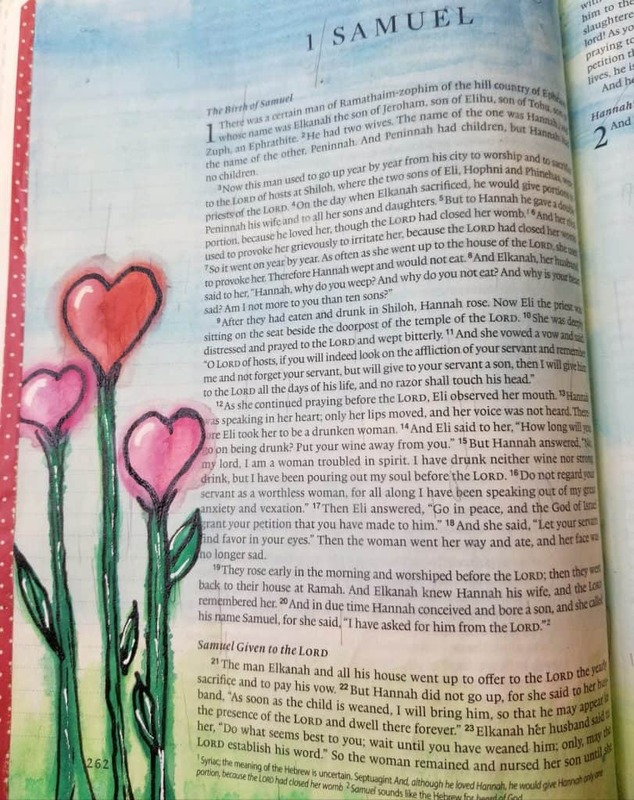 This flower for Bible journaling is soooooooooo easy! 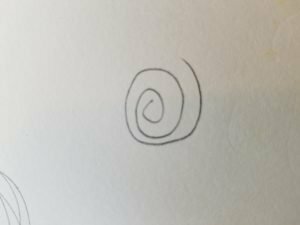 Draw a spiral (it can even be messy!) and add leaves. Then color. That’s all there is to it! 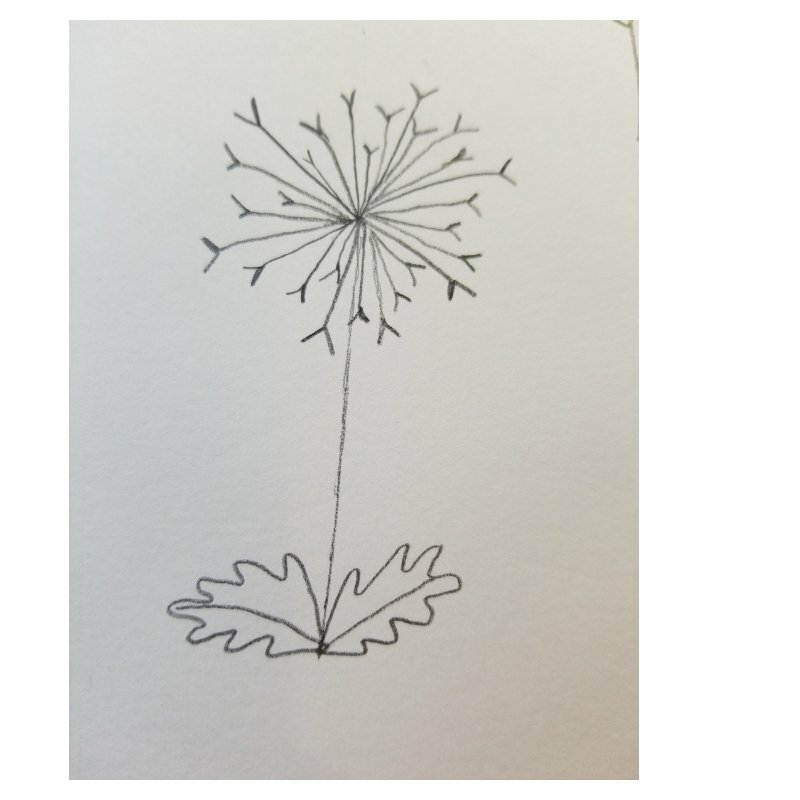 Dandelions may even be easier than a spiral as flowers for Bible journaling. So delicate, yet so pretty. 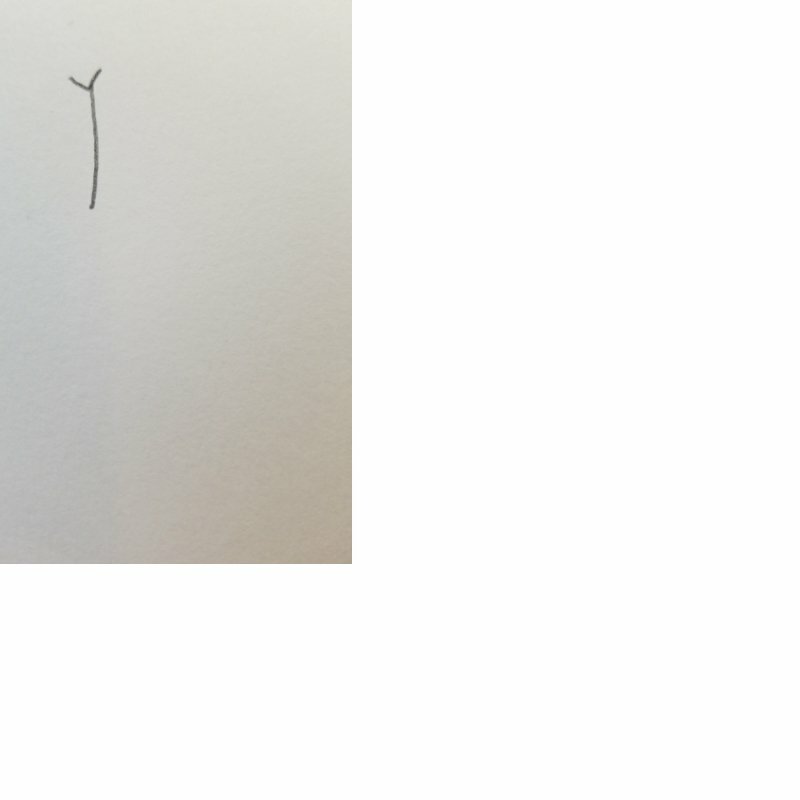 Start by drawing a line with a “V” at the end. 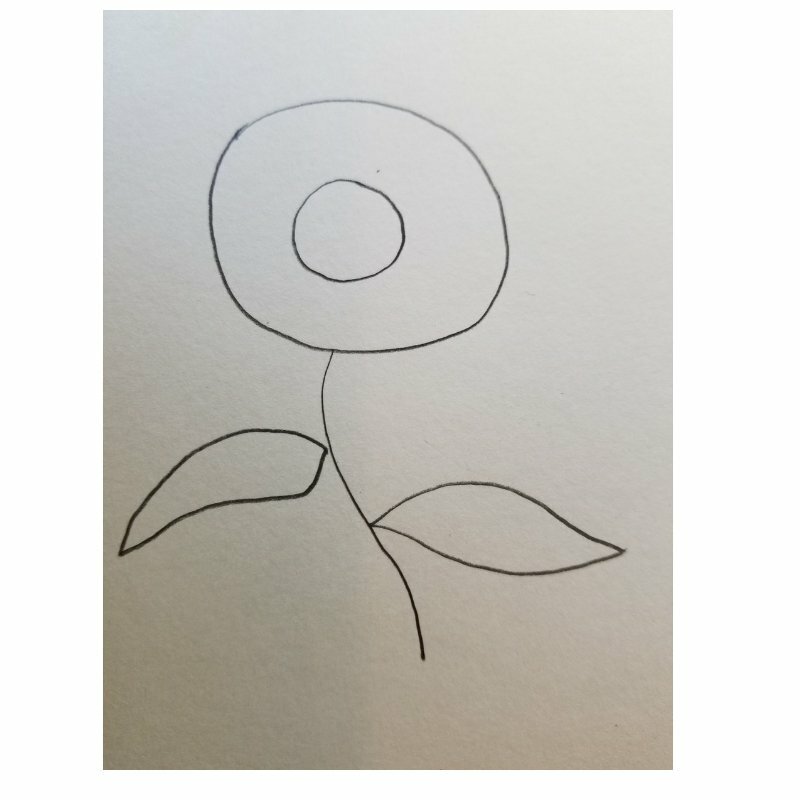 Draw these completely around the center in varying heights then add leaves. 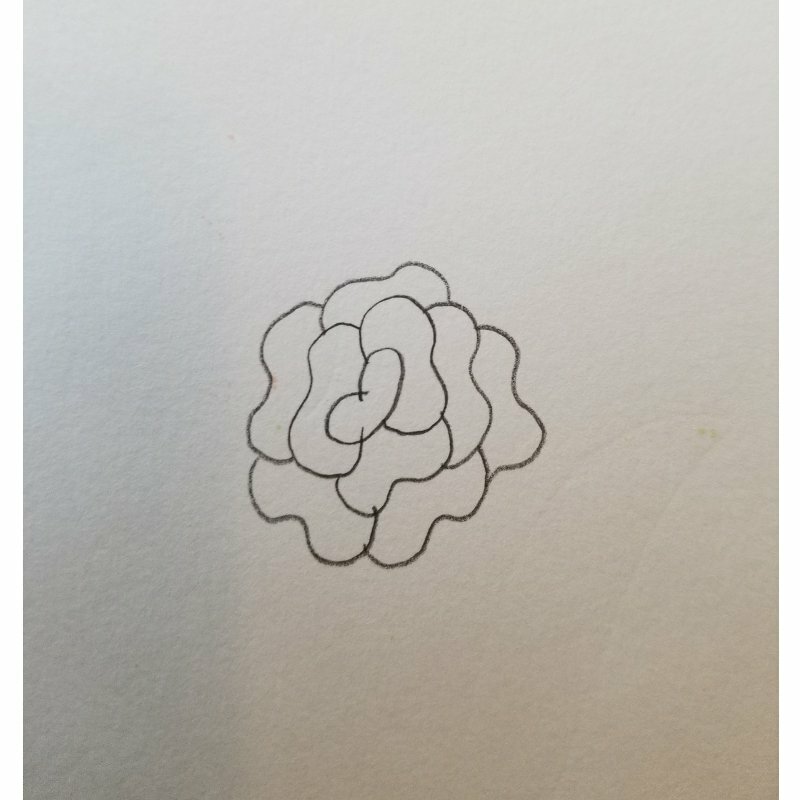 Well, to be honest, I don’t know if this one is actually a carnation, but I’m calling it that, anyway 🙂 Start by drawing an “ear-like” shape. 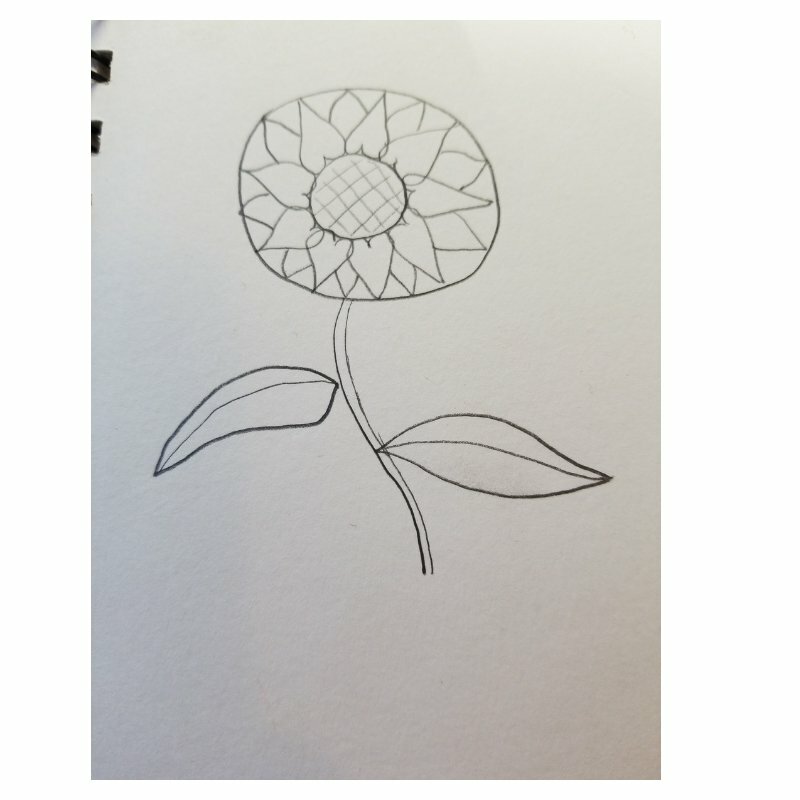 Continue adding this shape overlapping the shapes and adding as many as you like until you get to the desired size of flower. 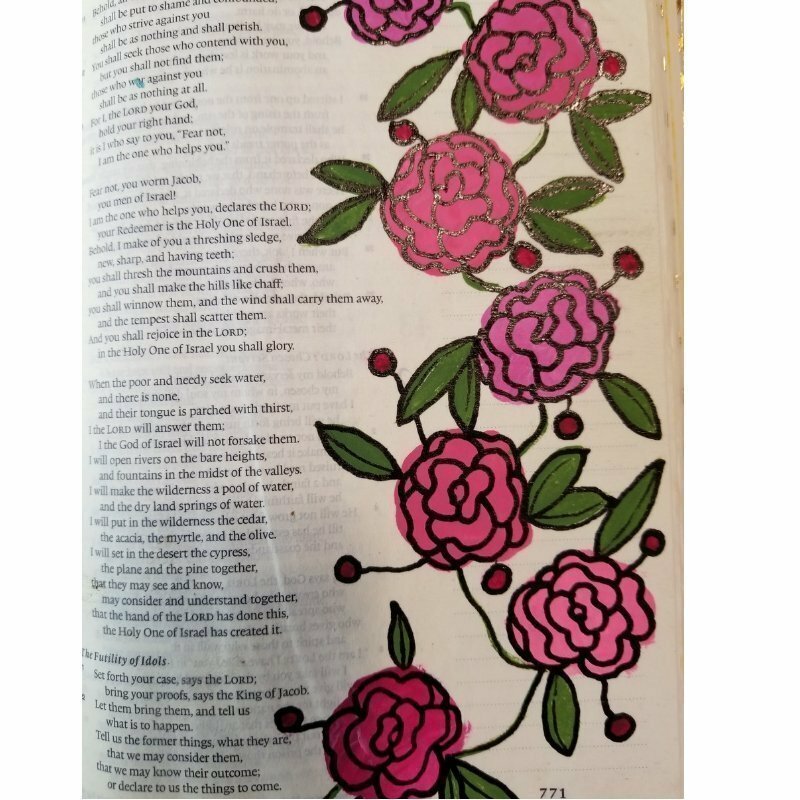 When I do this one, I color a sloppy circle first, then draw the flower details over it in black as show in the Bible journaling page below. Finish by adding details like leaves, stems and berries, if you choose. 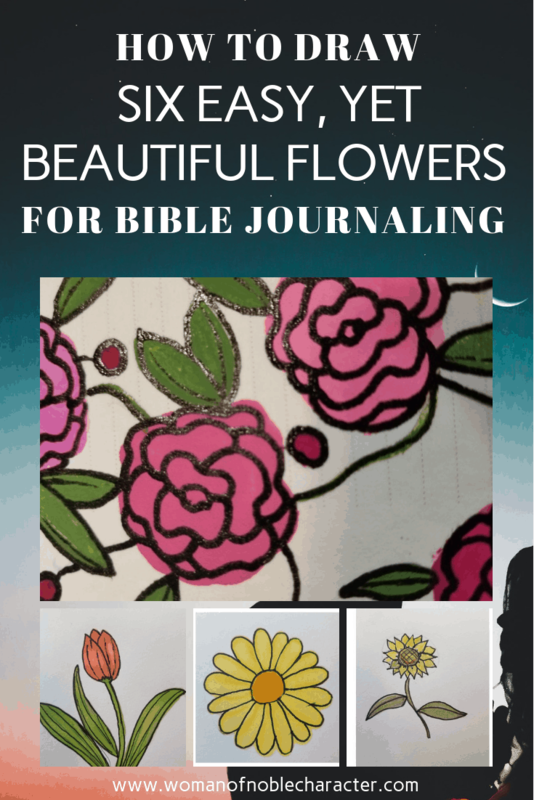 Here are some more flowers for Bible journaling that are quite easy. Heart flowers (as you can see in the picture below, they are simply hearts with stems and leaves!) and “splotch” flowers. To create splotch flowers, just add a splotch of watercolor paint and add flower details over it. 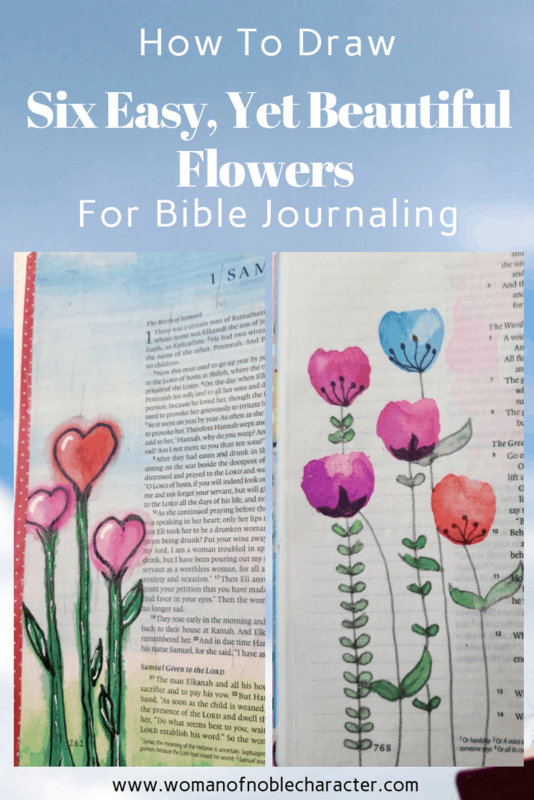 You can have so much fun with flowers for Bible journaling! 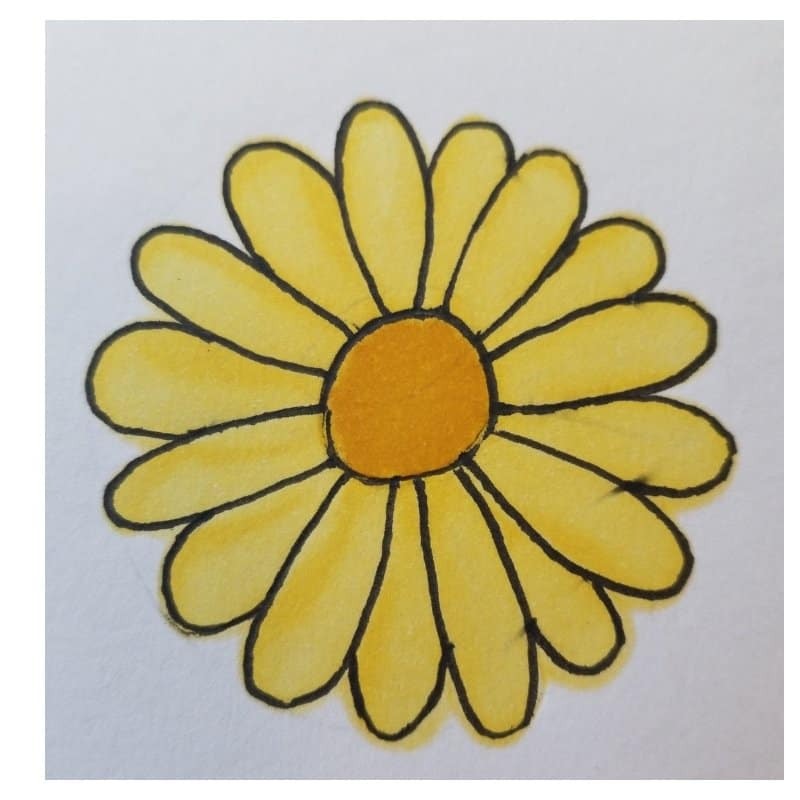 They can be used on pages about flowers or, really any page that you want to highlight. 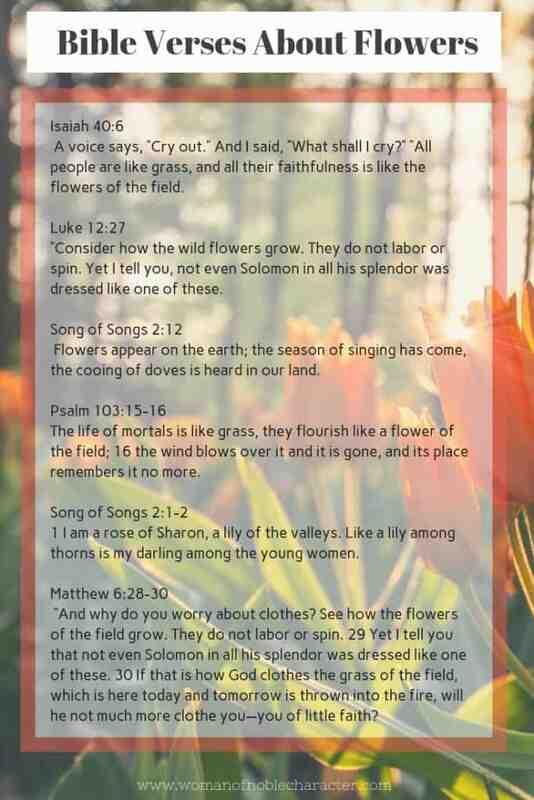 Here are some great Bible verses about flowers that are great for Bible journaling and reflecting on His Word. 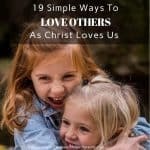 (click the photo to download a PDF or pin on Pinterest to find later). 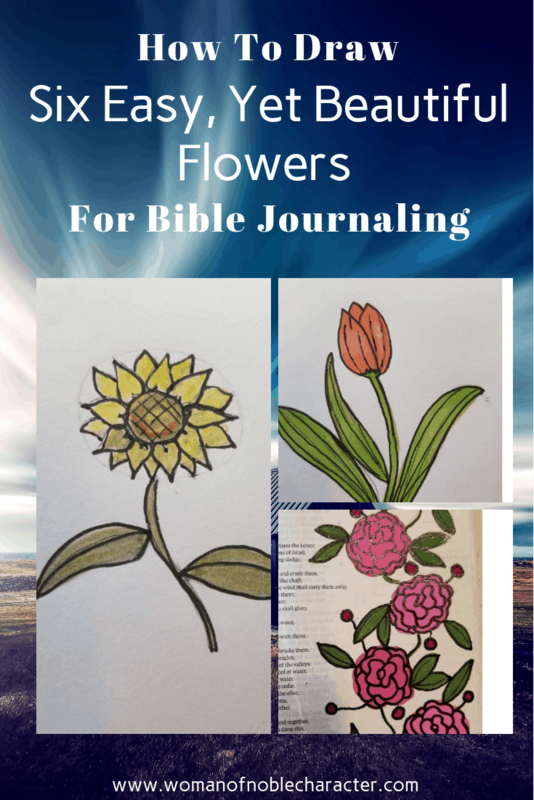 Which of the flowers for Bible journaling are you going to try the next time you create a Bible journaling page? 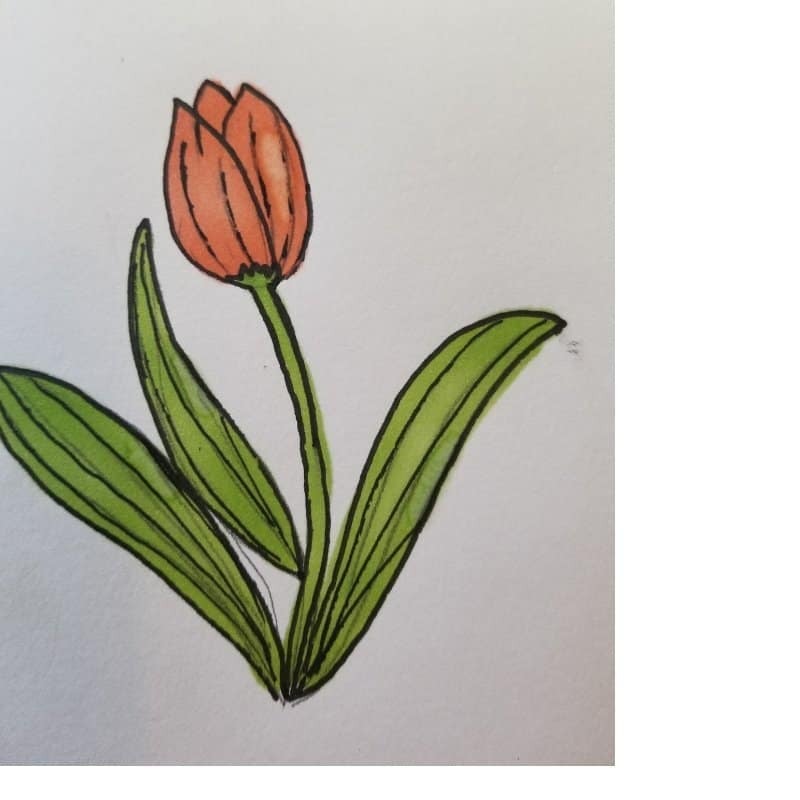 What other flowers or objects would you like to see tutorials on? 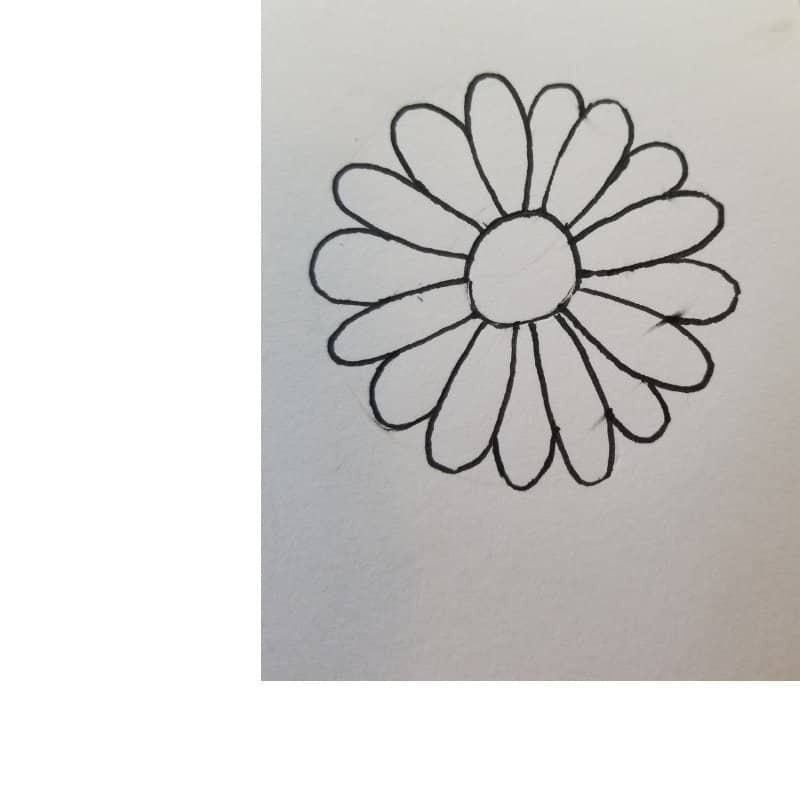 For a great book on how to draw easy flowers, check this one out. It’s one of my favorites! 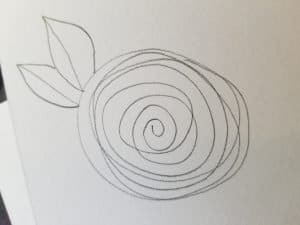 Prefer to draw fruit? 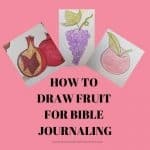 🙂 I’ve written an extensive post on how to draw fruit in your Bible journaling. 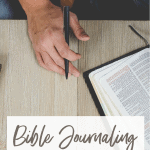 I’d love to hear from you and see your Bible journaling pages.